The Skinny: The premise is interesting, but this atmospheric fantasy is told in a slow manner, and features a dense mythos that even fans may not understand. How can a director take an episodic manga with little in the way of origin stories and make a 130-minute feature film out of it? If you're writer/director Katsuhiro Otomo, you would simply take three episodes of the subsequent anime and tape them together in hopes of producing something coherent. However, the edges show quite obviously in Bugmaster, a live-action adaptation of the award-winning manga by Yuki Urushibana about a one-eyed man with silver hair who walks around late 1800's rural Japan getting rid of mystical bugs. Bugmasters such as Ginko (Joe Odagiri as the aforementioned one-eyed man) are some of the only people in the world who can see these mystical bugs because they have these bugs inhabiting their bodies as well. 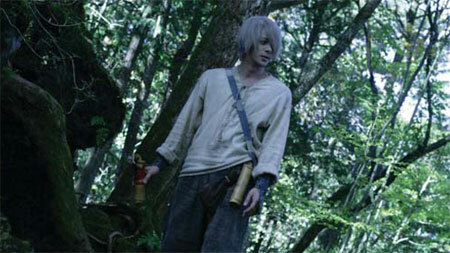 The film starts on one of Ginko's bug-ridding missions in a quiet snow-covered guest house that he happens to pass by. There, he comes across a bug that crawls into people's ears and eats the sounds they hear (remember, they're mystical bugs). He sees a particularly difficult case in a young girl, but being the young and brilliant bugmaster that he is, he manages to cure her anyway. Then he simply goes on his way. The problem with adapting Bugmaster is that the source material's structure is that episodic in the first place. However, instead of producing one extended episode with an isolated story, Otomo also crams in an origin story with flashbacks that is told along with the sound-eating bug episode. We find out slowly how Ginko got his name and how he lost his eye. We also eventually find out that the bug inside Ginko, named Tokoyami, is a dangerous and powerful bug. When a mysterious old woman unleashes the bug, it threatens the lives of not only Ginko himself, but also Tanyu (Aoi Yu, in a thankless role), the keeper of the sacred bug records. However, understanding what the Tokoyami really does relies on your understanding of the Bugmaster mythos, which is presented in an increasingly dense manner. The story is also told with a dreary and foreboding style; everything unfolds slowly, and the film doesn't possess much in the way of a climax. While the bugs in the first episode are suitably creepy, there's little dramatic tension throughout the film. The bugs don't make very interesting villains when all they do is crawl around and float in slow motion, but Ginko's process of bug extermination is what keeps things interesting, and probably the main reason why the original manga won multiple awards. However, that only applies when we actually understand what the bugs do. At points, the explanations can unfold in such ambiguous language that those who can't catch them will simply be lost.